A friend of mine on Facebook used the Year in Status Collage application and pondered if it was going to replace our Christmas letters. I played with it and found it gave a pretty accurate snapshot into what my year had been like. It reminded me of things I had already forgotten. My dad says that the adult years pass so quickly, and he is right. Things happen. Funny things. Sad things. Stressful things. Lucky things. It’s weird seeing it summed up by short witty Facebook phrases. The husband is still working for the same company. As I understand it, he’s starting to work more internationally (there have been conference calls to India!) We both feel very fortunate to be working when there’s so many people looking for jobs these days. He is a patient patient man who has been very supportive with all the changes this year. The girl is in second grade and now a proud member of Prep Choir of the Colorado Children’s Chorale. She has learned many of the same songs I learned back in the ’80s when I was in CCC. They do way more choreography now, though. So cute! The husband and I went to the Christmas Concert. When I asked her what it was like to sing at Boettcher Hall, her eyes grew wide and she answered, “Awesome.” Yep. She’s my kid. Like my dad says, it all goes by pretty quickly and life at our house is anything but boring. So my Christmas wish for you, my friends, is that 2011 is chock full of not boring things and witty Facebook statuses. What is the plural of status, anyway? PS You’ll notice (the boy often uses this phrase) I did not mention the C word this year. In fact, I think this year, the C word is Crazy. Heh. Or Christmas. Or even Cookie. As in, I have not actually made any Christmas cookies this year and it’s now Christmas Eve. Oops. Or Card. As in, I have not actually sent out my Christmas cards. Maybe everybody gets Valentines this year. So I’ve been absent again. December is a crazy months in the music world. Anyway, it’s winter break now and one of my first orders of business is baking! I made chocolate chip zucchini bread fro the cooking light cook book and sarah’s now infamous pumpkin gingerbread. My lazy cooking tip for baking is to buy the snack sized no sugar added applesauces. Each portion is 4 oz which is just about right for most baking projects. 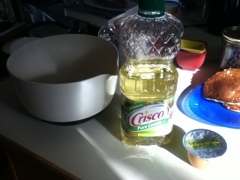 A lot of quick bread recipes call for up to a cup of oil which I replace all or some with applesauce. Better for you and nobody can tell. Sneaky. I know.